The present study evaluated the survival of S. lalandi larvae cultivated in a mesocosm system (50 m3 pool) and inoculated in submerged PVC cages with mesh walls and bottom (450 μm Swiss Nylon). The larvae were fed rotifers and artemia supplemented with the probiotic bacterium Pseudoalteromonas sp. SLP1 and the microalga Nannochloropsis gaditana. Larval survival was evaluated at the stage prior to changing the diet from live feed to pellets. Three months after feeding of the larvae with pellet, the growth (length/weight) and the specific growth rate (SGR) of the larvae supplemented with probiotics were recorded in the initial phase of the culture versus those not treated with probiotics. Higher survival was observed in larvae fed the probiotic supplement than in the control larvae (t-test=4.896, p<0.05). Larval growth in control and treatment increased, with significant differences observed during the three months. The SGR index did not present significant differences between the contol and treatment. These data indicate that after 3 months there were no differences in the growth of fish supplemented with or without probiotics. The results indicate that the addition of the microalga N. gaditana and the probiotic bacterium Pseudoaltermonas sp. SLP1 in the live feed, such as rotifers and artemia, is a good dietary alternative and improves the survival of S. lalandi larvae. The use of probiotics to optimize cultivation systems serves as an example of an ecological remediation alternative that can be applied to other cultures of commercial interest. Seriola lalandi is currently cultivated in Japan, Australia and Chile. The situation of the culture of S. lalandi in Chile is increasing due to the support of government agencies and programmes for diversification of the Chilean aquaculture industry (PDACH) (Fernandez et al., 2015). Its cultivation has been diversified in different areas of the world (Sicuro and Luzzana, 2016) because of increasing scientific and technical knowledge regarding the cultivation of this promising aquaculture species (Aguilera et al., 2013). Sicuro and Luzzana (2016), suggested that the main obstacles impeding the expansion of S. lalandi cultivation were related to disease, the lack of genetic improvement programs, and incomplete knowledge of the nutritional requirements of the species. They also claimed that the success of Seriola spp. aquaculture in Japan was due to the use of an integrated system between producers’ associations, research institutes and the central government. The authors concluded that bottlenecks in the development of Seriola spp. aquaculture must be addressed within a framework of medium-term public policies. The use of probiotics in fish culture has been studied for its application in the prevention of diseases caused by pathogens to ensure healthy populations and to maximize the production of the species in cultivation. The route of entry of probiotics is often the host digestive tract, and its modes of action may include competitive exclusion and modulation of the immune system (Newaj-Fyzul et al., 2014). Although some research demonstrates the potential of marine microbial metabolites, their role as feed ingredients is not well documented. However, recent advances in food technology have opened a number of new avenues for the development of natural substances, such as feed or feed ingredients (Dewapriya and Kim, 2014). The introduction of probiotics in hosts where they are not endemic can cause serious damage to aquaculture production because they spread and subsequently become endemic in farming systems. For this reason, it is important to obtain probiotics from the same organism for which production is to be optimized. For example, probiotics isolated from the crab Scylla serrata used in the larviculture (100,000 liters) of the same crab improved larval survival by inhibiting bacteria of the family Flavobacteriaceae, which caused necrosis in larvae on day 7 of cultivation (Dan and Hamasaki, 2015). Similarly, Morya et al. (2014) confirmed that the probiotic activity of the bacterium Pseudoalteromonas sp. in the aquaculture of the crab Portunus trituberculatus improved survival and reduced the pathogen load of Vibrio harveyi. Pham et al. (2014) observed that treatment of the post-larvae of the shrimp Litopenaeus stylirostris with probiotic strain NC201 of the genus Pseudoalteromonas resulted in significantly higher survival and antagonistic activity against Vibrio harveyi. Additionally, immunity analyses showed an increase of the Litsty PEN3 peptide in the larvae, which was considered to be an anti-microbial defense system. The use of mesocosms for fish farming is effective for several species (Divanach and Kentouri, 2000; Prieto et al., 2006) including Seriola dumerili (Papandroulakis et al., 2005); Pagrus pagrus (Andrade et al., 2015); Dicentrarchus labrax (Zouiten et al., 2011); and Epinephelus marginatus (Cunha et al., 2009). Recently, there has been a push for the controlled production of cultures without antibiotics. The antagonistic properties of bacteria against diseases are gaining importance as a replacement for antibiotics to generate bacterial resistance in aquaculture. The objectives of our study were to evaluate the survival of S. lalandi larvae cultivated in mesocosm systems and fed with rotifers and artemia supplemented with the probiotic Pseudoalteromonas sp. SLP1 and the microalga Nannochloropsis gaditana. We used the microalga Nannochloropsis gaditana because of its fatty acid profile, which were analyzed in our laboratory, indicating that it is composed of fatty acids (% w/w) as: C14:0 (1.61); C16:0 (3.63); C16:1 (5.06); C18:1n9c (0.89); C18:2n6c (1.01); C22:1n9+C20:4n6 (0.56); C20:5 (3.99). On the other hand, the microalga N. gaditana is easy to produce in massive culture and have no problems of contamination. The bacterial strain used was Pseudoalteromonas sp. SLP1, which was obtained from the collection of the Marine Mesocosm Laboratory of the University of Antofagasta (Universidad de Antofagasta-UANTOF). The bacterium was previously isolated from the gonads of S. lalandi, exhibited inhibitory effects against the pathogen Yersinia ruckeri and was negative for hemolysis, proteolysis and lipolysis (Sayes et al., 2016). The rotifers used were Brachionus rotundiformis and Brachionus plicatilis. The microalgae and rotifers were obtained from the collection of the Unit of Applied Microbiology of UANTOF. The Artemia sp. strains were purchased for production (Biomarine, Aquatecno). The experiment was performed in the Marine Mesocosm Laboratory of UANTOF in cube-shaped cultivation cages made of PVC for structural support (800 l of useful volume). The walls and the bottom were made of 450-μm mesh screen (Swiss Nylon). The cages were immersed in a 50-m3 pool with a side window. A network of stone air diffusers with 600-micron pores was placed inside and outside of each cage to maintain water circulation, homogeneous feed distribution and required oxygen levels (Figure 1). The photoperiod was 16 hours of light and 8 hours of darkness, and the temperature and oxygen were monitored daily. Due to we had a swimming pool for the cultivation conditions and to prevent the experimental control from being colonized by probiotic bacteria, the experiment was first performed with control cages without probiotics, then the probiotic treatment was initiated. This situation forced us to work with batch of different larvae in control and treatment. Figure 1: Diagram of the mesocosm system used for larviculture of S. lalandi. Five days before introducing the larvae into the cages, the pool water was renewed and recirculated by filtration using a foam fractionator and a UV filter. The system also had a biofilter to remove nitrogenous wastes. Two days prior to the introduction of the larvae, the system was inoculated with green water for 5 days by introducing the microalga N. gaditana at a concentration of 250,000 cells/ml (Figure 2). Figure 2: Sequence of culture pre-conditioning of S. lalandi larvae and approximate program of feed supplementation of the controls/treatments with the rotifers and artemia supplemented with probiotics. Feed was added to each cage by dripping through a silicone hose (5 mm diameter) from a 20-liter bucket placed high with aeration to allow the gradual release of the feed. The drip flow was regulated by a valve, and the buckets were filled with microalgae at 10:00 am and 6:00 pm for continuous feed supplementation over 24 h. Because the rotifer and artemia feed was smaller than the pore size of the mesh screen, there was a risk that they would leave the cage before being consumed by the larvae. However, the frequency of the feed drip permitted constant feed availability for the larvae. The average concentration of feed added to the culture was 1 × 108 cells/ml. The S. lalandi larvae were obtained from the reproduction stock of the fish farming unit at UANTOF. The eggs were removed from the collector, taken to an incubation unit and placed in 250 l conical tanks with constant air and water flow. They were incubated until the larvae hatched (approximately 2 days) and then kept for 1 day in the incubation tank. The larvae were subsequently counted and placed in a 20 l bucket for transport to the mesocosm cultivation unit. Prior to inoculating them in the cages, the larvae were acclimated with gradual water exchange over a period of 25 min. Approximately 20 to 30 larvae/l were placed in each cage 1 day post-hatching (dph). The initial inoculum of larvae for control and treatment was 16,000 larvae/cage. The experiment consists of control and treatment which were carried out in duplicate during the summer period (between January - March). The addition of feed to the larviculture (One day after the mouth of the larvae opened) of each of the treatments and controls was performed as shown in Figure 2. On the day that the larvae were inoculated, the rotifer B. rotundiformis was added to the system for 2 days and then, the rotifer B. plicatilis was inoculated for 12 days (both at a concentration of 6-16 rotifers/ ml). On day 8 of cultivation (day 1 of the cultivation being when the larvae were inoculated into the mesocosm system), Artemia sp. at the nauplius stage was introduced in conjunction with the rotifers at a concentration of 8-16 nauplii/ml. the exact day that the addition of the rotifers was stopped depended on the size of the larvae because the larval quality varied from 1 batch to the next. The incorporation of probiotics to the rotifer and artemia was performed previously in the following manner. Rotifers were cultivated in separate bag of B. plicatilis and B. rotundiformis a density of 10 rotifers/ml in 450-liter of culture medium and it is added the microalga N. gaditana 1 × 104 cells/ml with probiotic bacteria Pseudoalteromonas sp. SLP1 daily at a concentration of 1 × 103 cells/ml for the treatments (without probiotic bacteria for control). Then, starting at cultivation day 14, only artemia (metanauplii) were added until the end of the experiment. The artemia cysts (Biomarine®) were hydrated for an hour in potable water and then incubated for 24 h in seawater with the following parameters: salinity, 28%; temperature 28°C; pH 7-8; O2, 6 mg; constant aeration; and 2000 Lux. After 12 hours of incubation, the cysts were sieved (200-100 μm) to collect the hatched nauplii, which were placed in a clean bioreactor with seawater at 35% salinity and constant aeration. A total of 100 nauplii/ml of artemia were inoculated with the microalga N. gaditana at 1 × 104 cells/ ml and the probiotic bacterium Pseudoalteromonas sp. SLP1 at a concentration of 1 × 103 cells/ml (without probiotic bacteria for control). The concentration of rotifer feed added to the controls and treatments varied between 5.3 × 106 and 3.4 × 107 rotifers/ ml until approximately day 10 of cultivation and then decreased due to the smaller number of larvae and the addition of artemia. The artemia concentration fluctuated between 1.7 × 105 and 3.6 × 106 artemias/ml, with an exponential trend at the end of the experiment. To determine larval survival, a total count of larvae per cage was conducted at the end of the experiment. Aeration provided by the diffusing stone was eliminated, causing the larvae to rise to the surface. Mesh was used to collect the living larvae and carefully transfer them to a bucket of seawater. A beaker was used to place the larvae into another bucket while they were counted 1 by 1. Larval survival was evaluated in the period that was supplemented with probiotics (live food phase) at day 20 of culture that is in the period of transition from live to inert food (pellet). The transition was performed gradually, mixing nauplius of artemia with pellets (INVE model Proton) of 100 microns of caliber during approximately 10 days in which the artemia was gradually removed until leaving only the pellet. The caliber of the pellet was then increased to 180 microns for the next 14 days. Subsequently increased from 300, 500 to 600 microns and then from 1.5 to 4 mm at the end of the experiment. The addition of different pellet caliber depended on the size of the larvae in each treatment and control. During this period larval growth was recorded for a period of 3 months. For this, the length and weight of 15 individuals were recorded monthly. The specific growth rate (SGR) of the larvae that were supplemented with probiotics in the initial phase versus larvae not supplemented with probiotics was then evaluated, according Ricker (Ricker, 1979). The data were checked for normality and homoscedasticity. The larval survival were analyzed by t-test, statistical significance was established at p<0.05 and the values presented in percentages were transformed into arcsin function before analysis. The lenght and weight data were analyzed by ANOVA and Tukey´s Multiple comparison test with statistical significance established at p<0.05. The analyzed were performed using the GraphPad PRISM 5.0 statistical software (GraphPad Software Inc., San Diego, CA, USA). Data are presented as values ± standard error of the mean. Each treatment and control experiment lasted an average of 25 days, including the days for preparing the mesocosm system prior to larvae inoculation. The temperature and oxygen were recorded, no significant differences between control and treatment, in temperature °C an average of 22.35 (deviation 0.34) was obtained and in control 22.03 (deviation 0.63), for oxygen mg/l in treatment an average of 6.78 (deviation 0.68) was obtained and in control 6.21 (deviation 0.43). The photoperiod was 16 hours light/8 hours darkness. The survival experiment was terminated when the larvae began to cannibalize each other due to size differences. To continue the experiment for a longer time runs the risk of not being able to clearly discriminate the reason for mortality. Considering that the batch of larvae used in control and treatment were different, significant differences between them were equally observed. Working with different batch of larvae was a bias we anticipated, however, because we proposed to work in an experimental volume of 50 m3 and to have only one swimming pool, we could not do the experience in parallel, the transfer of probiotics to control cages was inevitable because of the pore size of the meshes. For this reason we decided to work with different batch, starting first with control that assured us not to "contaminate" with probiotics the pool that would later be used to inoculate the treatment cages. At the end of the larval culture, a 3.1% survival rate was obtained for control and 16% survival was obtained for treatment (Figure 3). The initial inoculum in control and treatment was approximately 16,000 larvae/cage. The statistical analyzes showed significant differences (t-test=4.896, p<0.05) of the treatment with probiotic respect to the control. Figure 3: Survival (%) of Seriola lalandi larvae grown in cages in mesocosm systems. Significant differences were observed between bacteria supplemented with probiotic (Treatment) respect to bacteria without probiotic (Control) (t-test=4.896, p<0.05). Control: N. gaditana+B. rotundiformis+B. plicatilis+Artemia sp.+Larvae. Treatment: N. gaditana+B. rotundiformis+B. plicatilis+Artemia sp.+Pseudoalteromonas sp. SLP1+larvae. Bars represent ± standard error of the mean. With respect to growth analyzes it was observed that in control and treatment the larvae tend to increase their size in length and weight. In both growth parameters, significant differences (p<0.05) were observed in the 3 monthly samplings, either for control and treatment (Figure 4). Figure 4: Seriola lalandi larvae grown in cages in mesocosm systems. Upper figure: larval length and lower figure: larval weight. Obtained after 3 months of being fed with inert food (pellet). Treatment: larvae supplemented with probiotics in the first 20 days of culture. Control: larvae not treated with probiotics. Bars represent ± standard error of the mean. The relationship between the specific growth rate (SGR) of the larvae, expressed as a percentage of body weight in length was 1.2% (treatment) and 1.1% (control), in weight 3.3% (treatment) and 3.2% (control). The t-test analyzes of SGR obtained in control and treatment for length and weight indicate that there are no significant differences (t=0.06, p<0.05). These data indicate that after 3 months there were no differences in the growth of fish supplemented with or without probiotics. Parallel to these monthly growth samplings we did not record larval survival, since we thought to do so at month 6. Unfortunately, due to an electrical failure that occurred during the night we suffered the total mortality of the fish and thus losing valuable information. This problem did not allow us to compare the survival of fed larvae with live feed supplemented with probiotics versus inert feed. We evaluated the survival of S. lalandi larvae fed rotifers and artemia supplemented with the microalga N. gaditana and the probiotic bacterium Pseudoalteromonas sp. SLP1, which was isolated from healthy specimens of the same species (Sayes et al., 2016). Our results confirm the probiotic effectiveness of the bacterium Pseudoalteromonas sp. SLP1 because the highest survival occurred in treatments with probiotics (16%) compared to the control (3%) in the mesocosm system. 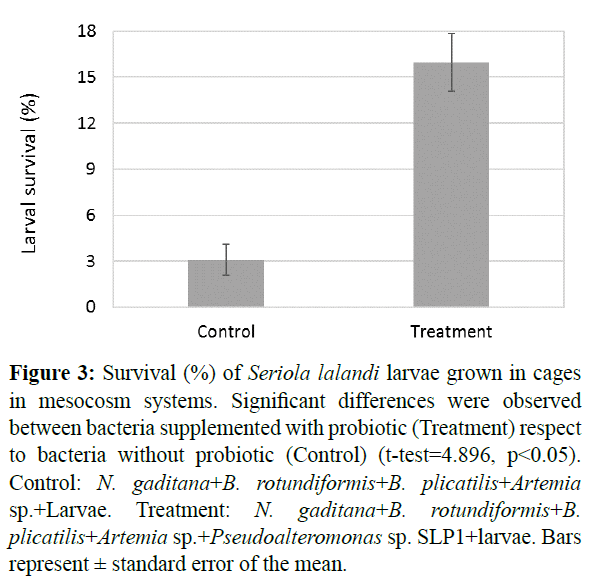 These results coincide with those obtained in our laboratory (Leyton et al., 2017), where we checked the survival improvement in S. lalandi larvae supplemented with the probiotic Pseudoalteromonas sp. SLP1 cultivated in ponds of 450 l. Another study in mesocosmos system but with another species of Seriola was the one made by Papandroulakis et al. (2005), who obtained 3.5% larval survival of Seriola dumerili cultivated in 40 m3 mesocosms, with the difference that in this study the larvae was inoculated the larvae directly into the ponds (swiming pool) and not in cages like us. Also the feed was distributed manually twice daily until day 17 of cultivation, then the artemia nauplii were added 4-5 times a day until the 20th day of cultivation. In our study, feed was added by a continuous drip system and was available over the entire 24 h period. Probably the difference in feed availability between these studies may account for the greater survival observed in our results because the larvae had constant feed that allowed them to feed ad libitum. Furthermore, the feed was also supplement with the probiotic bacterium Pseudoalteromonas sp. SLP1. Some recognized benefits for this genre has been reported by Wesseling (2015) who suggests that Pseudoalteromonas sp. could protect fish eggs against infection from pathogens through the bioactive compounds of this bacterium. Additionally, the author suggested that Pseudoalteromonas sp. bacteria could be applied to aquaculture as probiotics coupled with fish feed to improve the health of the fish. Which is reaffirmed with our results; On the other hand, the antipathogenic activity reported by (Sayes et al., 2016) of Pseudoaltermonas sp., against Yersinia ruckeri may be an advantage that improves larval survival and may inhibit pathogens bacteria, thus preventing the colonization of these in the organism at this stage of development of S. lalandi. On the other hand, the fish are rich in polyunsaturated fatty acids and in lower proportion of saturated fatty acids. In particular, they are a good source of fatty acids such as ω-6 (arachidonic) and ω-3 (Eicosapentaenoic and docosaxaenoic) (FAO, 2010; Bowyer et al., 2012), their regular consumption can have numerous health benefits (FAO, 2010; Bowyer et al., 2012; Anon, 2014). Among the benefits attributed to it are brain development (Innis, 2007) and prevention of cardiovascular diseases (Kromhout et al., 2012). Adding diets rich in fatty acids in the different stages of S. lalandi culture, such as N. gaditana may favor the nutritional quality of the fish fillet. It was also observed that rotifers and artemias were good vectors of probiotic bacteria. Similar results were obtained by (Rotman et al., 2016), who observed that rotifers and artemia supplemented with the organic acid taurine provided beneficial effects in terms of growth and survival in fishes with 20.1% compared to the control with 9.1% in S. lalandi larvae. The parameters of temperature, dissolved oxygen and the photoperiod of our experiment were similar to those described by Papandroulakis et al. (2005) in his experience with S. dumerilli larvae, but the photoperiod was different because they exposed the larvae to light 24 hours a day. Although the species of fish was different in the study of Papandroulakis et al. (2005) with our experiment, both experiments used the same species of rotifers and artemias as live feed, the differences in the results are due to the use of a different microalga (Chlorella minutissima) in conjunction with the addition of copepods, as observed by Papandroulakis et al., 2005. In our study, we added the rotifer B. rotundiformis during the first 2 days of cultivation to improve the ability of the larvae to capture them because of their smaller mouth size on the first few days after hatching and then the rotifer B. plicatilis. The sum of these factors, besides the microalga used in our experiment N. gaditana and also supplemented probiotic bacterium could improve the nutritional quality of the larvae in our results. Regarding the specific growth rate (SGR) according to Aguilera et al. (2013) in their work, they indicate that smaller S. lalandi fish grow faster and use the food better than larger sizes. SGR publications in S. lalandi are scarce to allow us to make a broad comparison of our results. In the work of Aguilera et al. (2013), a SGR of 5.95% was obtained in S. lalandi fish weighing approximately 50 g. In our work we obtained a SGR of 3.3% (treatment) and 3.2 (control) in fish with an approximate weight of 14 - 16 gr. These SGR results may be relevant information for other comparative studies with this species in the weight ranges studied. In Chile the first research related to the cultivation of the S. lalandi species began in 2004 with the financing of a FONDEFCONICYT project (code D03I1173) entitled "Development of a culture technology for the production in captivity of Seriola lalandi in the north of Chile ". The efforts that have been made during these 13 years have been related to the extraction of the sea of broodstock to stimulate the spawning in laboratory and to maintain the cultives of juveniles in confined systems. However, the problems that have been faced are due to the high mortalities in the early larval stages of this species. Our investigations regarding the use of probiotics in the early larval stages of S. lalandi are the first developed whose interesting results were published by Sayes et al., 2016; Leyton et al., 2017 and Mata et al., 2017. This new research that we are reporting had the objective of evaluating the probiotic effectiveness in larger volumes of cultives, thinking about a future industrial application. Although the results obtained are auspicious, there is certainly the need to develop more applied research that allows us to validate the probiotic benefits of the bacterium Pseudoalteromonas sp. Based on this information, our results are an important contribution to the current knowledge on the optimal cultivation system for this species. New challenges for achieving success in S. lalandi larviculture include optimizing the availability of probiotic feed at the industrial level to meet the hight feed demand for in large scale the culture of S. lalandi. The authors thank the FONDEF DE10I1050 project for financial support. Fernandez, G., Cichero, D., Patel A., Martinez, V. (2015) Genetic structure of Chilean populations of Seriola lalandi for the diversification of the national aquaculture in the north of Chile. LatAmJAquat Res 43, 374-379. Sicuro, B., Luzzana, U. (2016) The State of Seriola spp. Other Than Yellowtail (S. quinqueradiata) Farming in the World.Rev Fish Sci Aquac.24, 314-325. Aguilera, E., Yany, G., Romero, J. (2013) Cultivable intestinal microbiota of yellowtail juveniles (Seriola lalandi) in an aquaculture system. Lat Am J Aquat Res 41, 395-403. Newaj-Fyzul, A., Al-Harbi, A.H., Austin, B. (2014) Review: Developments in the use of probiotics for disease control in aquaculture. Aquaculture 431, 1-11. Dewapriya, P., Kim, SK. (2014) Marine microorganisms: An emerging avenue in modern nutraceuticals and functional foods. Food Res Int56, 115-125. Dan, S., Hamasaki, K. (2015) Evaluation of the effects of probiotics in controlling bacterial necrosis symptoms in larvae of the mud crab Scylla serrata during mass seed production. Aquac Int 23,277-296. Morya, V.K., Choi, W., Kim, E.K. (2014) Isolation and characterization of Pseudoalteromonas sp. from fermented Korean food, as an antagonist to Vibrio harveyi. Appl Microbiol Biotechnol 98, 1389-1395. Pham, D., Ansquer, D., Chevalier, A., Dauga, C., Peyramale, A.,et al. (2014) Selection and characterization of potential probiotic bacteria for Litopenaeus stylirostris shrimp hatcheries in New Caledonia. Aquaculture 432, 475-482. 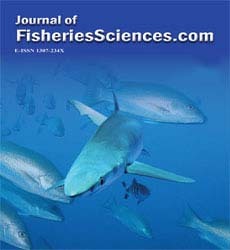 Divanach, P., Kentouri, M. (2000) Hatchery techniques for specific diversification in Mediterranean finfish larviculture. Recent advances in Mediterranean aquaculture finfish species diversification. Zaragoza. CIHEAM 75-87 (Cahiers Options Méditerranéennes; n. 47). Prieto, M., Castaño, F., Sierra, J., Logato, P., Botero, J. (2006) Alimento vivo en la larvicultura de peces marinos: Copépodos y Mesocosmos. Rev MVZ Córdoba 11, 30–36. Papandroulakis, N.T., Mylonas, C.C., Maingot, E., Divanach, P. (2005) First results of greater amberjack (Seriola dumerili) larval rearing in mesocosm. Aquaculture 155-161. Andrade, C.A.P., Soares, F., Ribeiro, L., Roo, F.J., Socorro, J.A., et al. (2015) Morphological, Histological, Histochemical and Behavioral Aspects during Early Development of Red Porgy Pagrus pagrus L. Reared in Mesocosm. Turk J Fish Aquat SC15, 137-148. Zouiten, D., Khemis, B.I., Masmoudi, S.A., Huelvan, C., Cahu, C. (2011) Comparison of growth, digestive system maturation and skeletal development in sea bass larvae reared in an intensive or a mesocosm system. Aquacult Res42: 1723-1736. Cunha, M.E., Quental, H., Barradas, A., Pousão-Ferreira, P., Cabrita, E., et al. (2009) Rearing larvae of dusky grouper, Epinephelus marginatus (Lowe, 1834), (Pisces: Serranidae) in a semi-extensive mesocosm. Sci. Mar 73,201-212. Sayes, C., Leyton, Y., Riquelme, C.E. (2016) Bacteria Pseudoaltermonas sp. con potencial probiótico para cultivos larvales de peces. Lat Am J Aquat Res 44,76-84. Ricker, W.E. (1979) Growth rates and models. In: Hoar, W.S.,Randall, D. J., Brett, J. R. (editors). Fish physiology, Volume VIII, Bioenergetics and growth. Academic Press. New York, United States. pp: 599-675. Leyton, Y., Sayes, C., Mejias, C., Abarca, M., Wilson, R., et al. (2017) Increased larval survival of Seriola lalandi using Pseudoalteromonas sp. as probiotics. Revista de Biología Marina y oceanografía. 52,95-101. Wesselin, W. (2015) Beneficial biofilms in marine aquaculture? Linking points of biofilm formation mechanisms in Pseudomonas aeruginosa and Pseudoalteromonas species. Bioengineering 2, 104-125. FAO (2010) Fats and fatty acids in human nutrition. Report of an expert consultation. Report No. 91. Rome, Italy: FAO Food and nutrition. Bowyer, J.N., Qin, J.G., Smullen, R.P., Stone, D.A.J. (2012) Replacement of fish oil by poultry oil and canola oil in yellowtail kingfish (Seriola lalandi) at optimal and suboptimal temperatures. Aquaculture 356, 211-222. Anon (2014) Seafood Choices: Balancing Benefits and Risks. Institute of Medicine of the National Academies. Retrieved October 2014. Innis, S.M. (2007) Dietary (n-3) fatty acids and brain development. J Nutrition 137, 855-859. Kromhout, D., Yasuda, S., Geleijnse, J.M.,Shimokawa, H. (2012) Fish oil and omega-3 fatty acids in cardiovascular disease: do they really work? European Heart J 33, 436-443. Rotman, F., Stuart, K., Drawbridge M. (2016) Effects of taurine supplementation in live feeds on larval rearing performance of California yellowtail Seriola lalandi and white seabass Atractoscion nobilis. Aquacult Res1-8. Aguilera, E., Yany, G., Romero, J. (2013) Cultivable intestinal microbiota of yellowtail juveniles (Seriola lalandi) in an aquaculture system. LatAm J Aquat Res. 41. Mata, M.T., Luza, M.F., Riquelme, C.E. (2017)Production of diatom–bacteria biofilm isolated from Seriola lalandi cultures for aquaculture application. Aquac Res48, 4308-4320.